During the last two years, a number of books and articles have appeared in public on the subject of colloidal silver. Some of these include: the Bio-Tech News Special Report, "Hi-Yo Silver"; Colloidal Silver, The Natural Antibiotic Alternative, by Zane Baranowski; Colloidal Silver, by Tonita d'Raye; and "Banishing Disease with Three Nine Volt Batteries", parts I & II, by Mark Metcalf. Literally hundreds of other newsletters and small publications have repeated the information in these articles without checking the content for accuracy. The appearance of these materials two years ago was the first wave of public education concerning colloidal silver. Today, most Health Food Stores carry and sell several brands of colloidal silver, scores of MLM companies have colloidal silver products in their lines, and prices are starting to drop. While it is still possible to spend as much as $10/oz. for colloidal silver in Health Food Stores, prices can be as low as $5/oz. Some mail order catalogs sell it for as little as $2.50/oz., and I have seen small classified ads selling it for under $1/oz. The trend is definitely toward a lower price. One of the phenomena driving the price down is the appearance of the devices that allow people to make their own colloidal silver. At this time, (Spring 1997) the cottage industry of colloidal silver generators is starting to penetrate the larger market. This is starting to cause alarm in high places. One major commercial manufacturer of colloidal silver has recently issued a warning statement to its customers, alerting them to the dangers of the "inferior quality" of colloidal silver made by these devices. CNN and other major media have also tried to scare the public away from colloidal silver by showing a blue-skinned person who "suffers" from Argyria, a cosmetic condition caused by the build-up of silver compounds under the skin. Even JAMA (The Journal of the American Medical Association) has run articles warning of Argyria and the toxicities associated with "colloidal silver proteins." On January 16, 1997, new labeling guidelines concerning colloidal silver went into effect, issued by the FDA. Other FDA rulings on "safety and effectiveness" are still pending. With all of these developments, it doesn't take a rocket scientist to see that the whole situation around colloidal silver is heating up! The purpose of this article is to raise the level of public knowledge to a higher degree of accuracy. 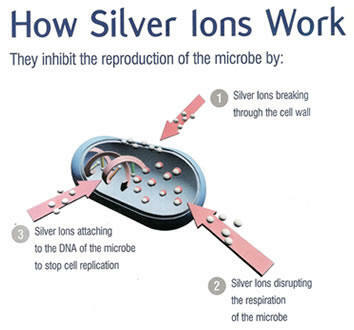 Knowledge is power, and the public needs to know the truth about colloidal silver. The first thing people need to know is that there are at least FOUR different products on the market being called COLLOIDAL SILVER. The first type of product is the classic, original kind, usually called "electro-colloidal silver." This product is made either by the "electro-arc" method in deionized water, or by the "low voltage electrolysis" method in distilled water. This product is usually found in concentrations between 3-5 ppm (parts per million), but sometimes as high as 100 ppm. Properly made, this product consists of microscopic particles of pure, elemental silver suspended in water, with no other elements present. Each particle of silver carries a POSITIVE electrical charge. Colloidal silver made this way appears either transparent-clear or transparent-light yellow. The second is called "mild silver protein." This product chemically binds microscopic particles of silver to a protein molecule. It is usually found in concentrations between 20-40 ppm. Its appearance may be transparent-clear or amber. The third are "silver salts." These products can be made either chemically or electro-chemically and usually create a form of silver that DISSOLVES in the water. Concentrations range between 50-500 ppm. Its appearance is transparent-clear. The silver particles do carry a POSITIVE electrical charge, but almost invariably, these products contain other elements or compounds other than silver. The fourth is sometimes referred to as "powdered silver." This product was developed by the Russians and is made when a pure silver wire is rapidly disintegrated by an high voltage electrical discharge, similar to an old photographic flash bulb. The microscopic silver dust is collected and either dissolved in water or added to salves and creams for topical use. Concentrations range from 100-500 ppm. All of these products work, to one degree or another, as a broad spectrum germicide because they all contain microscopic particles of SILVER. That said, it is important to understand a number of things: 1) all of these products are not "colloidal suspensions" of silver, 2) these products DO NOT all behave the same in the body or in laboratory tests, 3) effectiveness and dosage varies from product to product, 4) quality varies from product to product and from batch to batch with the same product, and 5) they are NOT all uniformly safe and non-toxic. There are no industry standards that manufacturers voluntarily follow to assure quality control and there is no governmental regulation of the industry. On the other hand, there are millions and millions of satisfied colloidal silver users who would like to have continued, free access to the product, and a growing number of manufacturers entering the market with a wide variety of new products.